Ellen tells Jessie about her social life, including lectures and plays at Princeton, and gives her clothing advice. I cannot tell you how distressed I feel at my long silence! It seemed as though during the last two weeks everything has been against me! The fact that I was not writing to you and dear little Nell has weighed on my mind hourlyliterally, and yet I could never find the time!—I began a rather important letter to the Yates on the 12th of April,—and it lies before me now unfinished. Since the first interruption I have never been able to resume. For one thing I have had to make an unusual number of trips to New York and Phila.—some on business, some on pleasure,—so you must not be too sorry for me for being so busy. Last Tuesday I took Margaret in to the Players Club in New York. Mr. McMurray who is a member had invited us to go with him to a reception. You know it is a famous house, (formerly) Booths) full of curios and splendid portraits,—and immensely interesting. Of course it would have been still more interesting if we had been with some one who knew the people. For instance we learned later that Alla Nazimova was there, and it would have been great fun to have identified her. On Thursday I went in again with your father, heard him give a magnificent lecture in the afternoon; and at night we went to hear Alla Nazimova;—who is perfectly wonderful. I never heard or saw more finished, delicate, exquisite acting. Unfortunately the play was not one to reveal her deeper powers,—a little parlour comedy, a mere trifle called—“Countess Coquette.” We were unfortunate in not getting to see her while she was still playing Ibsen. I came home Friday morning and that night we had a play here,—the much talked of Marlowes “Dr Faustus” by the English Dept. Everyone was there and everyone extraordinarily enthusiastic. It was a terribly difficult thing for young fellows (or anyone) to attempt, and their success was truly remarkable. I hope it is a happy augury for the future of “dramatic art”(!) in Princeton. It has at least been proven that the students can do something besides vaudeville and attract and interest a large audience in the doing. I am so sorry, dear, that the grey dress had to be dyed black! For of course you did not want another black one. You must just wear your green one freely there and here,—and the black one will do to knock about the mountains with.—Then in the early fall we will get a pretty new one. I sent it on to you last week. I tried to get the two Peter Pan waists in now but they did not have them in linen. See if you can get them in Balt.—if not Katie Murray can make them later. She comes on the 14thof May for a few days. Let me know at once if you want her to make them. They are so loose that I think she could perhaps make them by a pattern without fitting. 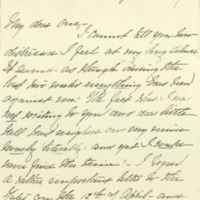 Wilson, Ellen Axson, “Ellen Axson Wilson to Jessie Woodrow Wilson Sayre,” 1907 April 29, WWP17389, Jessie Wilson Sayre Correspondence, Woodrow Wilson Presidential Library & Museum, Staunton, Virginia.